RSS leader Nadikkandi Haridas was hacked to death by the CPM 38 years ago in 1979. Sri. Haridas’s son, Hariprasad, shares his father’s memories with BJP leader Beegum Asha Sherin. “It was a time when the CPM would not allow the RSS to start a Shakha at Thalassery ( Kannur ). Some swayamsevaks were assigned to go there and give confidence to the local workers to start the Shakha. My father’s younger brother was to go there but fate decided that it was my father who was to walk that path towards death. 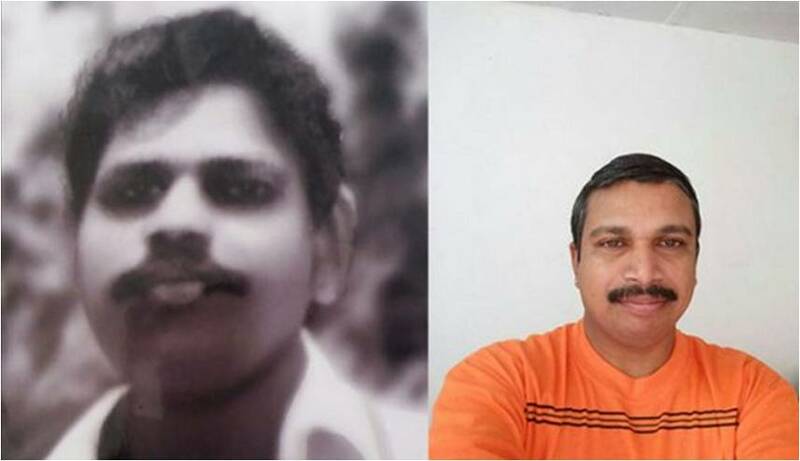 Many others like Parayil Divakaran, Varipra Dineshan, Akhil Ramachandran, Chaloor Balakrishnan delayed the embrace of death and continued working there for the Sangh for many more years. My father and some other swayamsevaks left for Thalassery from Kozhikode. He had taken bath at a pond near the Dinesh Beedi Company and then boarded a jeep towards the place where a Shakha was to be started. Before the jeep reached the destination, the group was identified by a man travelling in the opposite direction on a cycle. It is believed that it was this man who informed the Marxists. By then, the CPM had organised a large group to attack the arrivals. What happened next was the hacking of a hunter’s prey. It was a CPM stronghold and the memories of how just five people fought valiantly against overwhelming odds fills me with pride and brings tears to my eyes. It was decided that if they were attacked by large numbers, a whistle would be used as signal and everyone should rush back to the jeep as soon as it was blown. But death held my father back. Though the other four were able to come back to the jeep, my father could not. My father continued to fight. When he was about to be overwhelmed by the odds, he ran and entered a nearby house. The owner of the house was another CPM worker. The house owner unleashed a huge attack dog on my father. My father fought the dog, brushed it aside and ran again. The CPM gang was close in pursuit. The chase ended in front of a huge wall. As my father could not climb the huge wall, he used the branch of a nearby coconut tree to pull himself up and slither over the wall. He did not know death was waiting in the form of another person on the other side. God did not help him there too. The owner of the house pulled out a hatchet and chopped him repeatedly. The cut on his leg brought him down. The CPM gang who swarmed in hacked him repeatedly. Bleeding profusely, my father’s life ebbed away. After that, they tried to stop the ambulance, attack my father’s brother at the hospital and even to further mutilate my father’s body there. Swayamsevaks including Gopi Changanassery took my father’s brother Balan without informing him of my father’s death. He came to know about it on the way from a newspaper. My mother was just twenty one years old. I was just three. Two other sisters, twins, aged one and a half years. I am told by my mother that I was smiling when I kissed my father’s lifeless face for the last time. We were too young to know death. I still remember my father’s bag, his white dhoti, and his old big umbrella. He was taken away from me when I was just 3 years old; an age in which I could not remember a face. All I have left as an image of my father is a picture which was drawn by someone from his memory. This is all God has left me. After that, it was the Sangh ( RSS ) which took care of everything. A house was constructed in the 14 cents of land we had. In that period (1979) Rs. 20’000/- was put in my mother’s name along with Rs. 5000/- in each of the children’s name including my own. My whole life was under the shade of the Sangh. My father’s friend Parayil Divakaran became a mental patient. He died as a mental patient. Some years ago, my mother applied for my father’s death certificate as she wanted to apply for widow pension. However, by this time, the CPM had used their influence in the government during the years to erase any record of my father’s death. They told my mother that there wasn’t any report of such a man’s death. Yes, it is true. My father has not died. He is still alive and lives through the Sangh. They have no death. They are heroes. Heroic Balidanis do not die.